I recently listened to psychologist Kaern Kreyling describe the ways in which our minds are obsessed with maintaining constant inner dialogues in spite of the fact that silence dominates many layers of our subconscious. The brain and consciousness are vastly silent, she said, but we are often hypnotized by the small flood of doubts, mundane insecurities, philosophical musings, and “Did I remember to turn the stove off?” that crowd the top layer of our thoughts. Amidst our constant media inundations through the devices in our hands, we tend to forget the silence but are still desperately seeking it. We buy into the mythology of a spin class somehow destined to cure anxiety, laud prohibitively expensive “mindfulness retreats” when we could just as well follow a map to a stranger’s home or celebrate an oncoming storm. Krzysztof Kieślowski’s Three Colors: Red presents a stunning portrait of the power of silent human connection in spite of a superficial draw to noise. As Janet Maslin states in her 1994 New York Times review of the film, “Stories develop like photographs in a darkroom. They are sharply defined only in retrospect, when the process is complete.” Kieślowski examines love and coincidence with astounding poise, rendering the observer delightfully complicit in forming the relationships that arise and the hopes that spring in the face of a missed call, a wounded dog, and lost romantic connections. His characters are constantly seeking peace but are unable, until the film’s end, to find the silence that can truly bring them to rest and back to one another. His film is a tremendous testament to the power of connection and the ability of some beautiful, internal grace to guide people to the silence, if they will only pay attention. The telephone, a central focus of countless scenes in Red is the only real antagonist in the film. It acts as a block between people, a shade attempting to disrupt truth love, and much beauty throughout. Voices become weapons. Valentine’s (Irène Jacob) boyfriend summons her to the perilous waters of the English Channel, and Auguste (Jean-Pierre Lorit) makes plans and loses the woman he loves through the off-white chord of his landline. Their relationships are superficial; Kieślowski implies again and again that in order to love and to understand, one must be physically with someone and, of course, one must be silent. 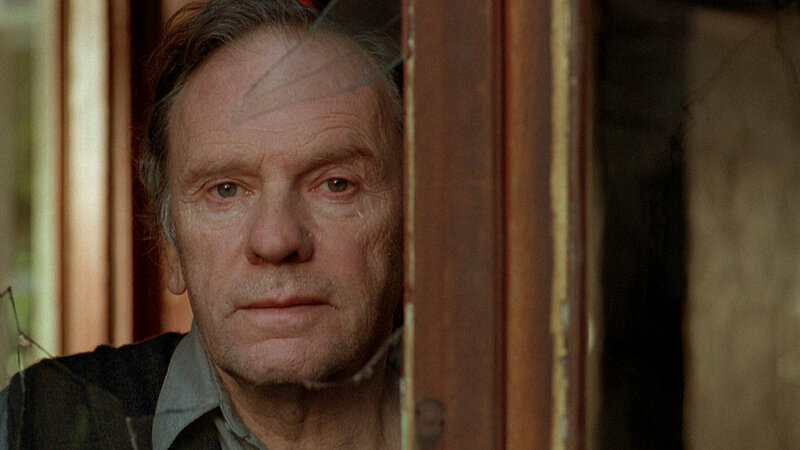 The Judge (Jean-Louis Trintignant) lives a solitary life in a tumble-down house; he is obsessed with the noise of others. Sitting alone in the dark, we watch his mind play out in the rising and falling of voices on his stereo screen. This man is deeply unhappy, not content with the musings of his own desperate mind, he must prey on the voices and feelings others to be satiated, and Valentine is similarly disgusted and enamored of his noise. The night outside is dark and silent. Rita, the sweet dog, is not moaning anymore, she is with the people who care for her and there is safety to be had in the assurance that they will love her. Yet, The Judge and Valentine are isolated. Their friendship springs from this night and the subsequent thawing of their initial icy self-righteousness. Much later on, when they share a drink in the stormy hall of Valentine’s show, there is psychological silence. A beautiful howling of the wind is the only sound amidst their hushed declarations of truth. Their friendship has allowed Kern to find solace in his own mind. He writes letters to his neighbors just as Auguste books passage on the ship to England; they are present, direct, and soulful. This is how the two men finally begin to emerge from the tumultuous cacophony of their heartbreak and into a silent comfort. Valentine, in many ways, embodies the kind of delicate self-possession that helps lead everyone back to silence, yet at the beginning of the film, we find her running her to the telephone, to a lover obsessed with the sound of her voice. She is trapped in the scene so brilliantly depicted in the opening credits, in telephones wires echoing across seas, in between walls, and underground. The telephone-world is a dismal place; we know that Valentine’s lover is all wrong, overbearing, jealous, but she sees him and her relationship with the distortion only her black telephone, perched perilously atop red table, can provide. Yet, though she is deceived by loud declarations of “care,” she is ultimately saved by her ability to sit comfortably with her own mind, and indeed, to quiet it down. In a truly spectacular scene, we see her entering the home of a man the Judge has been spying on with the intent to tell him that the Judge knows of his affair. Upon stepping beyond the threshold, she is met by his family and the loudness in her mind pauses, she reevaluates and leaves, understanding and finding peace with the simultaneous serenity and dangers of secrets. Valentine’s beauty doesn’t come from loud poetic declarations; instead, it appears in her ability to effortlessly blow a bubble without question and without laughter. She is not childish or pretentious, merely a woman who knows herself dancing and sweating in a crowded studio, or quietly consulting with a veterinarian in a dimly lit after hours clinic. She epitomizes growth in her melancholy; she ventures out onto the sea and finds quiet in the arms of another. She is human and deeply connected to her home: the little flat across the street from the place she buys a paper and the drive she learns to take in silence. Silence is Kieślowski’s surprising and absolutely necessary choice for a film entitled Red. There is no screaming in this film. The Judge is no crazed professor, merely a lonely man with a void in his heart and the voice of others dominating his mind. Auguste is loud only in action; boldness and racket only echoing in his agile clambering up a balcony and subsequent confrontation. The telephone does not ring like in some 1950s nightmare film, sounds buzz and tinkle, but never yell. Red is every part of this film, and Kieślowski’s brilliance is in allying such a crimson with a kind of gentleness hardly captured on screen. He explores the lower part of the mind, the kind hypnotized by simple beauty instead of by fear. Soft words exchanged in lamplight and the curve of a narrow drive are the backbone of his picture. Three Colors: Red is a testament to relationships, to subtlety, and to silence. Krzysztof Kieślowski’s Three Colors: Red has a simple plot but is filled with intricacies that, while complicated, are never confusing. Valentine, a young woman living in France, runs over a dog, and when she goes to return it she meets Joseph, an old judge who she discovers is eavesdropping on his neighbors. Joseph, moved by Valentine’s insistence that he is doing something wrong, turns himself in, and this sets off a chain of events that leads to Valentine and her neighbor, Auguste, who she has never met but who the reader sees is perfect for her. Through the use of a motif of broken glass, a story about a book, and the color red, Kieślowski connects these three characters so deeply that, although none of them have known each other for long, or even face-to-face, there is a clear path that they are all taking towards one another. Red: the color of love, but also of pain. The color of passion, but also of fear. It is the color that is starred in the movie, and Valentine and Auguste are both literally and figuratively connected by red. In a figurative sense, they are surrounded by it, suggesting that they themselves are very similar. There is red in their houses, on their clothes, Auguste has a red car, and they both have red names. They are connected in their love for the world, especially Valentine’s caring nature, but also in the pain and fear they have. They fear their partners do not love them, and they hurt because of it. Red also has a more literal importance to the story. It represents Rita’s blood after Valentine hits her, and how Rita’s injuries eventually connect Valentine and Auguste. Upon returning Rita, Valentine discovers Joseph’s habit of eavesdropping on neighbor’s conversations. They develop a friendship and Joseph eventually turns himself in. In court, where his whole neighborhood has gathered, Karin, Auguste’s girlfriend, meets a man who she ends up choosing over Auguste. Hurt and angry, Auguste decides to travel for some time, boarding the same ferry as Valentine. Glass, and specifically broken glass, is a motif that ties Auguste and Joseph together in a sideways fashion, making it seem as though Auguste is like a second Joseph, living Joseph’s life over again but this time correctly. The primary example of this takes place first in a bowling alley, where Auguste’s glass is shown broken at the top but still full of beer and upright. A while later, a scene in Joseph’s house shows a glass full of beer that is blown over by the wind. Its contents pour out of it but the glass remains unbroken, the exact opposite of Auguste’s glass. These similar but different endings to a tipped glass mirror the similar but different paths that their lives are taking, even before either of them is shown to be very similar. To strengthen the connection, Kieślowski shows Valentine cleaning up broken glass from the judge’s floor, which has a double meaning. She is simultaneously cleaning up his house and caring for him, but it is also referencing Auguste’s own broken glass, suggesting that Valentine, with her caring nature, will help both him and herself be fixed after the ferry sinking. The idea of the similar but different paths of Joseph and Auguste’s life is shown once again by a book. Towards the beginning of the movie, Auguste is crossing a street when he drops one of his schoolbooks on the ground. It falls open to a page on which a question that could potentially be on his exam has been underlined, and he is later shown studying that question. After his exam, Auguste’s then-girlfriend Karin asks him if they asked the question and he says no. Later in the movie, this experience is echoed when Joseph is telling Valentine about his past. He describes how he had dropped his book and it had fallen open to a question that he had not yet studied. But when Valentine asks if he was assigned that question, the judge says yes, showing the difference once again in he and Auguste’s experiences. A similar journey, but a different ending. Kieślowski’s Three Colors: Red is a beautiful almost-love story full of coincidences that are just barely within the limits of possibility. 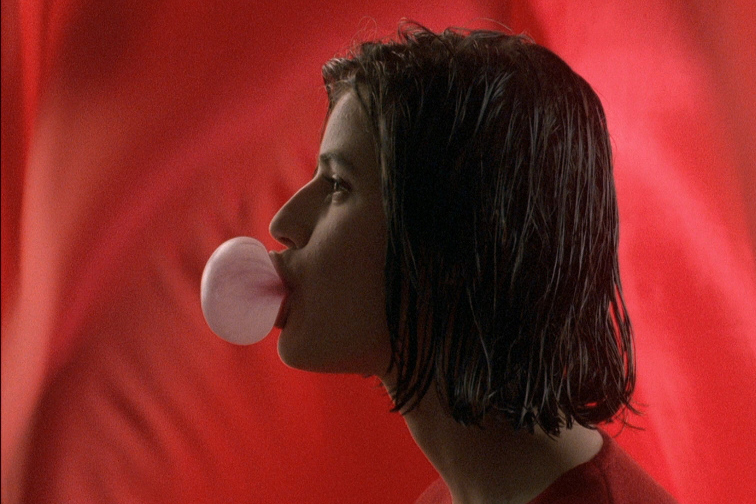 Be it books, glass, or the color red, Kieślowski gives the viewer an experience that is both nuanced and moving throughout, despite the many motifs. There is not a single moment where a line of dialogue or facial expression appears unnatural or contrived, and because of that I, at least, felt as though I was watching real life, and was therefore fully invested in the story all the way to the end, leaning forward in my seat until it was proven to the viewer that Valentine and Auguste were safe.